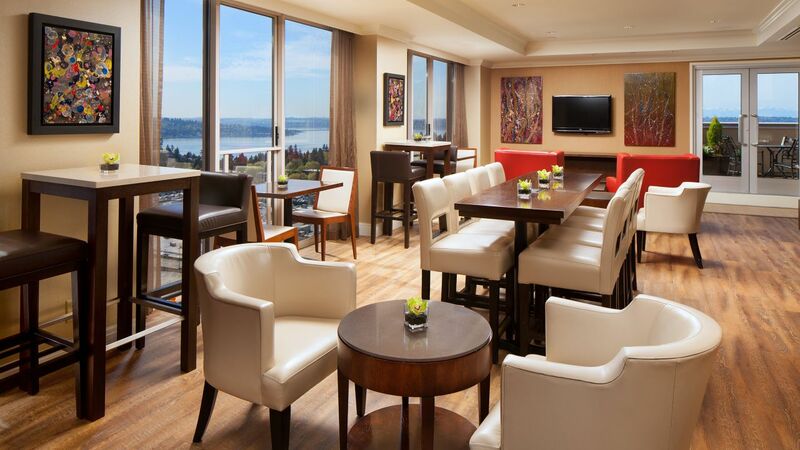 Hyatt Regency Bellevue offers 732 rooms with 39 suites in the heart of Seattle’s Eastside. Our inviting rooms offer a relaxing refuge that include spacious workstations with complimentary 10MB of bandwidth. 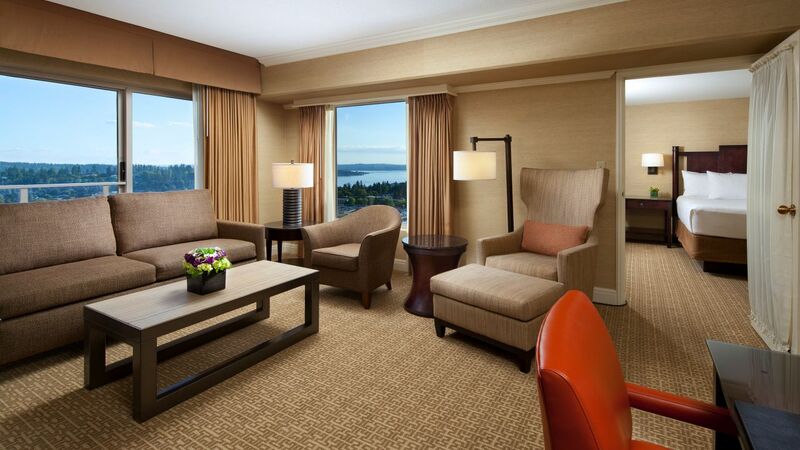 Enjoy views of the Cascade and Olympic mountain ranges, Lake Washington and the Seattle skyline when you book a high-floor room. 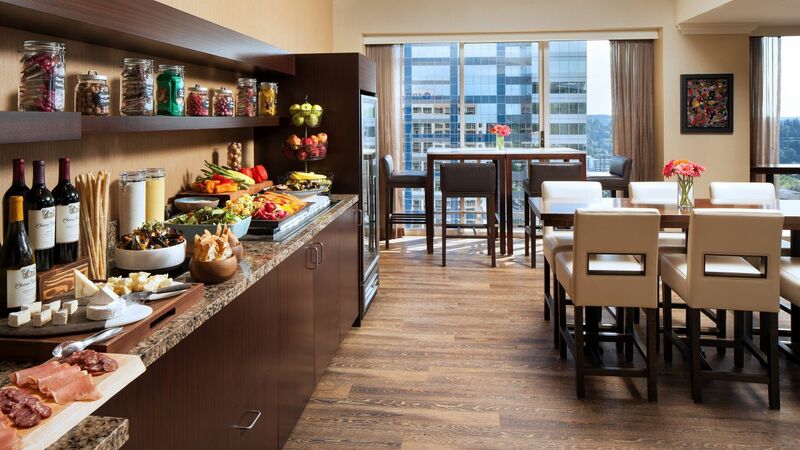 Add on Regency Club® for extra amenities and benefits. 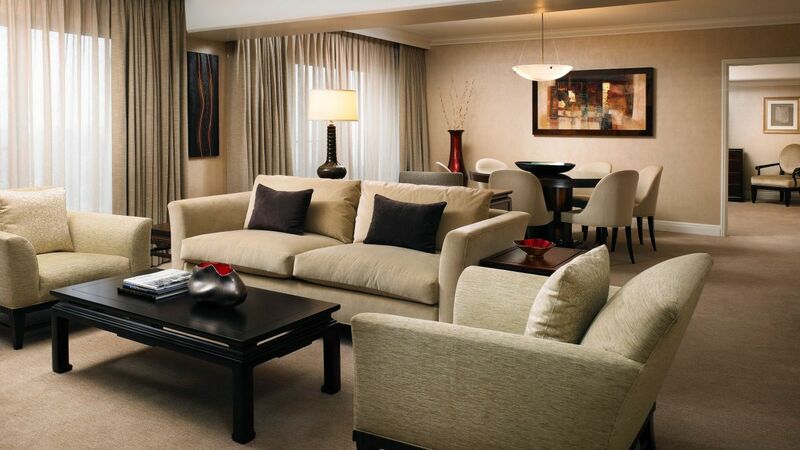 Spread out in this 514-square-foot corner suite with one king Hyatt Grand Bed™, a separate seating area with a queen sleeper sofa, and a spacious workstation. This is a standard suite. See World of Hyatt program terms for upgrade eligibility. 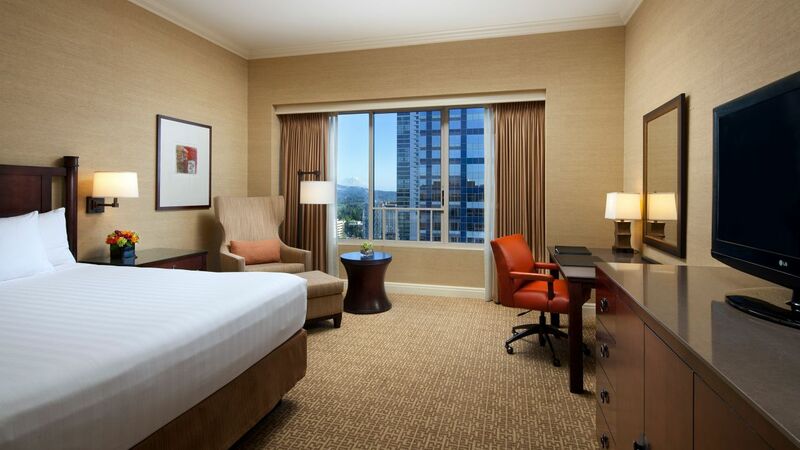 Enjoy the comfort if this 514-square-foot corner room with one king Hyatt Grand Bed™ and views of downtown Bellevue, Lake Washington, or Mount Rainier. This is a standard suite. See World of Hyatt program terms for upgrade eligibility. Spread out in this premium 750-square-foot suite featuring one king bed with privacy door, a separate living room with a queen-size sleeper sofa and a dining table. Our Executive suites are located on the 3rd floor of the Olympic Tower and offer easy access to meeting space. Enjoy views of Mount Rainier, Lake Washington, and downtown Bellevue in our one-bedroom suites from 1,100 to 1,500 square feet with one king Hyatt Grand Bed™. 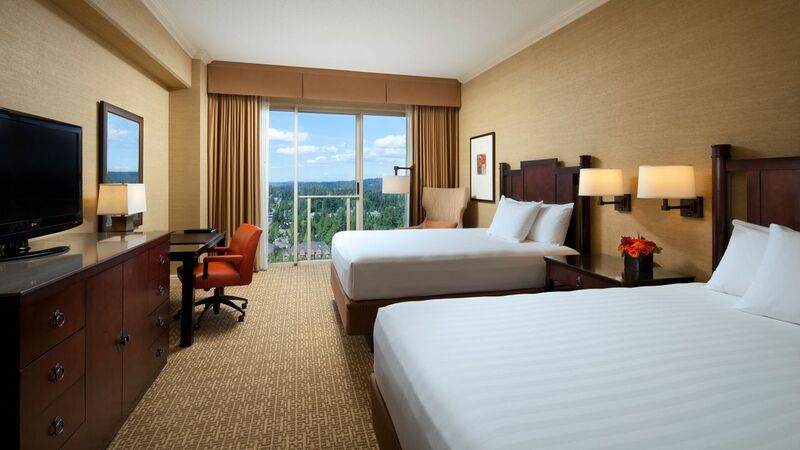 Relax and unwind in this 338-369-square-foot room with one king Hyatt Grand Bed™ and separate workstation with extra outlets and connections. Enjoy views of downtown Bellevue, Lake Washington, or Mount Rainier from floors 14 and above in our 369-square-foot room complete with a king bed. Treat yourself to extra space in this 504-square-foot corner room, complete with one king bed and a sitting area with a queen-sized sleeper sofa. 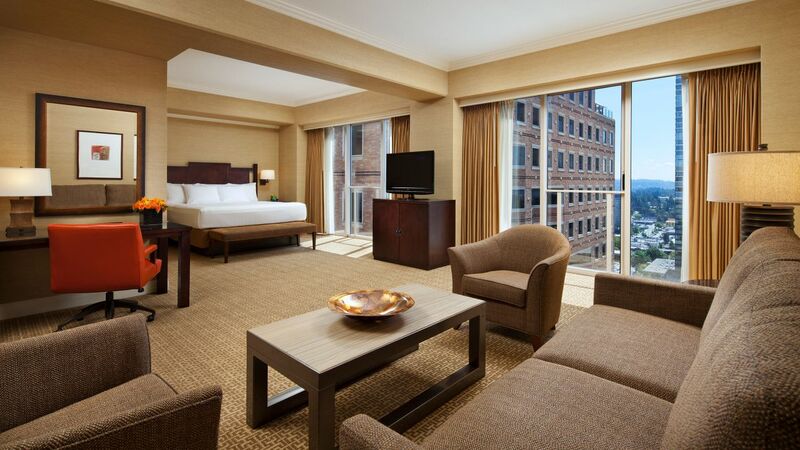 This ADA-compliant, 338- to 369-square-foot room features one king Hyatt Grand Bed™, an accessible bathtub, lowered entryway features, and a spacious workstation. This ADA-compliant, 338-369-square-foot room features one king Hyatt Grand Bed™, a roll-in shower, lowered entryway features, and a spacious workstation. 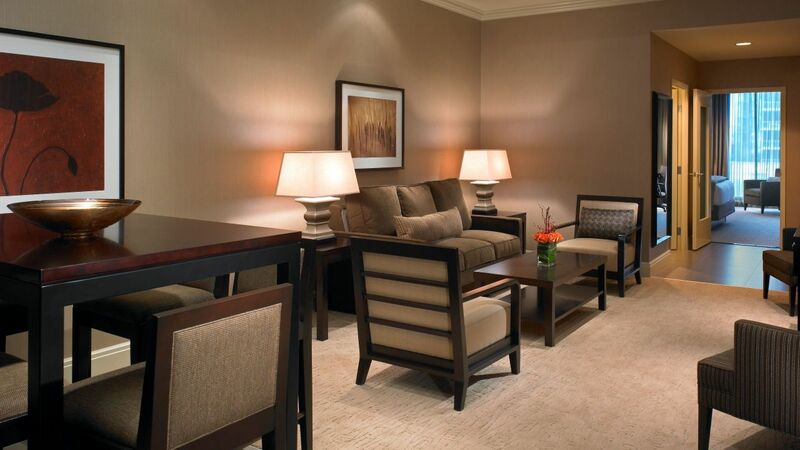 Upgrade to our 369-square-foot Regency Club room complete with one king bed and gain access to our private Regency Club. Spread out in this 514-square-foot room, complete with one king bed, a sitting area with a queen-sized sleeper sofa, and Regency Club lounge access. Enjoy your stay in this 338-369-square-foot room with one queen and one full Hyatt Grand Bed™, and separate workstation with extra outlets and connections. This ADA-compliant, 338-369-square-foot room features one queen and one full Hyatt Grand Bed™, a roll-in shower, lowered entryway features, and a spacious workstation. This ADA-compliant, 338- to 369-square-foot room features one queen and one full Hyatt Grand Bed™, an accessible bathtub, lowered entryway features, and a workstation. This 369-square-foot room offers one queen bed and one full bed, plus views of either Bellevue, Lake Washington, or Mount Rainier from floors 14 and above. Enjoy access to our private Regency Club lounge, when you stay in our 369-square-foot room complete with one queen bed and one full bed.